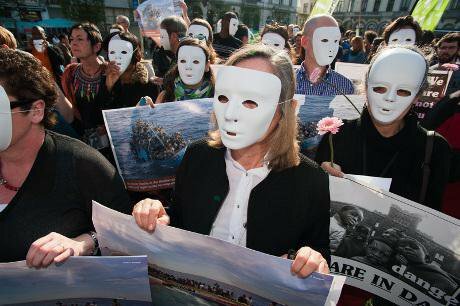 Piquing Europe's conscience: demonstrators in Brussels earlier this week wore white masks to represent those who had drowned in the Mediterranean. Demotix / Frederik Sadones. All rights reserved. Tougher border controls only increase migrants’ vulnerability—and make smugglers richer.